This one's for the male readers. I've been in some discussions about "nice guys". Some people don't get it, so I'm going to explain as concisely as possible. The way I have it figured, being a nice guy depends on your motivation. Being kindhearted, helpful, considerate and so forth are all admirable qualities and should be cultivated in everyone. And then there's the guy who is being "nice" because he thinks it will get him laid. I'm going to talk in generalities, because there are always exceptions. The "nice guy" thing that bothers me is Nice Guy Syndrome. (No, not all psychologists accept this, but I believe it anyway.) These fellows often have self-esteem problems and are out of touch with their own masculinity. They do not know what they want, or do not care. What matters most is pleasing others, especially the women. Essentially, they feel that if they are nice and act like Helpy Helperton all the time, women will be attracted by their fawning. OK, try this one. Remember the old cartoons with Spike the Bulldog and Chester the Terrier? Spike was being big and strong, and Chester was always trying to please Spike. He'd be bouncing around, saying, "Whaddya wanna do today, Spike? Huh?" When guys give that appearance, it is certainly not attractive to women. And it embarrasses the "Spike" guys, too. Listen up, guy. It doesn't work that way. This behavior does not spark attraction (and that's what you really want). Instead, it puts you in the "friend" category — if the babe in question will even give you a second glance. Women want "real" men, who have self-confidence, masculinity, who know what they want in life and in relationships, etc. Why do you think they keep going back to the jerks that treat them like dirt? Sure, some of these women have self-esteem issues. But consider this: The "bad boys" practically radiate confidence, and exhibit some of the "real man" qualities that women desire to see in you. Don't get me wrong! If you go out treating women like dirt because you think that's what they want, you're going to fail. Instead, develop some self-confidence and quit the constant fawning behavior. This kind of nice guy stuff is not good for you, for the ladies or for anyone. You do have a right to have your own needs met, so stop putting yourself last just so you can appear to be a nice guy. Check out this book and the online support group for more help. OK, so do we have it cleared up? Once again, be nice all you want, but consider your motives. And consider your own needs. It's great to be a nice guy, but it's miserable to be a doormat. Buona sera. Yours truly is a little bit steamed today. I have heard and written about things that go on where my friend Neil works. He told me some things, and I feel the need to rant. Maybe a manager with some sense will take the advice that I offer and make his or her company a better place. Some teams don't have to fake it with a forced smile. You take care of them, they take care of you, show mutual respect, everyone does what needs to be done and is happy. Untrained managers. People will be hired to boss a department that have no knowledge of the job; workers know the job inside out and managers have the skill level needed to be a Wal-Mart greeter. Too many managers. There are managers, CEOs, COOs, Corporate Officers, Team Leads, Managers, Supervisors — plenty of management, but most of them are not leaders. Capice? Managers are off-site. This company is very large, but does not pay to hire managers for departments in each location. Many people have never set eyes on their supervisors. Raises are scarce. Yes, I know that it's a tough economy. But too often, "the economy" is an excuse for being cheap. It's a crisis for this company when the quarterly reports show that they are not making as many tens of millions of dollars as they want. They tell the employees to work harder and to be happy that they have jobs in the first place, yet they are making very handsome profits. Taking advantage of the people that are making you rich is bad management. Merit raises are a good thing, but should be used in addition to cost of living increases for loyal employees. Bosses, don't come crying to me because of employee performance; you get what you pay for, and if you paid a decent amount, you'd get better work. Criteria are negative. These off-site managers do not know, really know, the performance of their employees. They use numbers ("More production! Move it!") and recorded data of errors. This is negative thinking. Worse, they have no way of knowing how well their employees succeed on other things that are not measured. Little respect for employees. Think about the term "human resources". What is a "resource"? Something that you use up, discard and replace. Places like this give capitalism a bad name. I hate to see this because my crew and I respect each other, and we know it can be done. We all know that there are companies that are struggling, and the employees should be glad just to be working. I repeat, the place I'm talking about has big money coming in and can afford to give its employees some sign of appreciation. The place where Neil works is a Fortune 500 company, but they certainly do not have a good showing in the "best places to work" surveys. That should come as no surprise. Perhaps the size of the company has a part in this. Perhaps not. What matters for any company is to get its management out of the Industrial Revolution mindset ("More! Faster!") and realize that they are dealing with people. And if the company takes care of its employees (not that stuff that they look at on paper and tell themselves that they are treating their employees well, but really wants to make them happy), then they will make the employer happy as well. It's all quite simple, really. Interesting how this comes along while I'm looking at material on simplifying and on minimalism. In this far future story, the survivors of a planet's war devolved into barbarism. This came about because nobody was able to take care of what was needed to keep the technology going. In times of power loss, we realize how dependent we are on technology that is driven by electricity. Once the power is restored, we can watch television, make telephone calls and go online. Some people are only slightly inconvenienced from those things, since they have battery-operated devices. But batteries run down. The East Coast blackout of 2003 shows the electricity dependence on a large scale. Electricity goes away, it feels like civilization itself goes away. There was an episode of "The Family Guy" where power was lost. Since there was no television, the family was at a loss for entertainment (the suggestion of lighting candles and reading books was laughed away). What would happen if power was out for a long period of time? If people learned to live in a simpler manner, their civilization would not have to deteriorate as completely as the one in Piper's story. Maybe the most skilled minimalists would be the new rulers? In Spy by Ted Bell, The Xucuru warriors of the Amazon are about to wipe out a boat crew. The boat has all sorts of high-tech weaponry, but has to travel very slowly. The Xucuru are primitive, almost naked, using blowguns and poisoned arrows. How to stop them from boarding the vessel? Carpet tacks spread all over the deck. Just some things for you to ponder and discuss. Buona sera. As you know, I've been examining minimalism. It turns out that there are several sites devoted to discussing the subject. Some writers have made statements that made me uncomfortable. I began to wonder, "Am I getting into something that looks good on the surface, but is a plank in a platform that I cannot sanction?" Not really. The philosophy of minimalism is disparate. One writer seemed to advocate something resembling communism, where everyone shares what they have, and nobody owns anything. Ummmm....yeah.Who regulates? Well, there is no overseer. Oh, I get it: anarchy. That may be your goal, Poindexter, but you're probably alone in that (people are selfish at heart, you see). Another advocates "social change through minimalism". That won't happen, Cupcake. You need some kind of uniform code and many like-minded people. A third writer on minimalism is a Christian. He finds that the philosophy fits in with Christian values. I have stated that clinging to stuff is contrary to the teachings of both God and Buddha. Just own what you really need, the rest is distraction. One guy is pretty extreme: Quit your job and have everything you own in your backpack. No thanks, Bubbles. I need some things to be able to function, and I need my job to pay bills and honor my commitments. But you go right ahead, let me know how that works for you. I would love to know where you stand on this in five or ten years. Going the minimalist route is great for the youthful nonconformist, that is certain. This from "The Prisoner" (the good series, not the 2009 drivel) comes to mind: "...youth with its enthusiasm, which rebels against any accepted norm because it must..." As I got older, I realized that this was true, youth rebels because it is part of the nature of youth. Anti-establishment, rock and roll and all that (except that the "values" of rock and roll today have become the "establishment" that was the target of rebellion). I know what it's like to be caught up in some kind of idealism. After learning and experiencing life more, the idealism has to change and deal with reality. Rebelling in a minimalist direction can be a good thing because you will not be as inclined to be like some people that I know, who love things and use people. So, what is minimalism? The core philosophy is simply to own and use as little as possible so you have time and money for what matters most in your life. After that, it means different things to different people. Personally, I am very interested in going one notch above minimalism: Simplifying. Get rid of clutter, unneedful things, distractions. This would fit in very well with many philosophies (with the probable exception of hedonism). I don't care what you believe, as long as you're not a drain on society. If you're interested in my links on personal productivity, simplifying and minimalism, click here. Note that workplace firewalls may block you simply because the page is at Angelfire. Try again at home. It's simple. Next: You might be glad to have minimalists around in this extreme "what if..." scenario. A little while before: Does "minimalist" government exist? Buon giorno. One of my goomahs sent me an e-card for Valentine's Day. (Kinda gets you right here, doesn't it?) Although I don't like sending e-cards very much (aside from embarrassingly sappy stuff, some of them also spam people), I clicked on "send a card back" button. When, what to my wondering eyes should appear but a requirement that I install their toolbar. I don't need a toolbar installed. 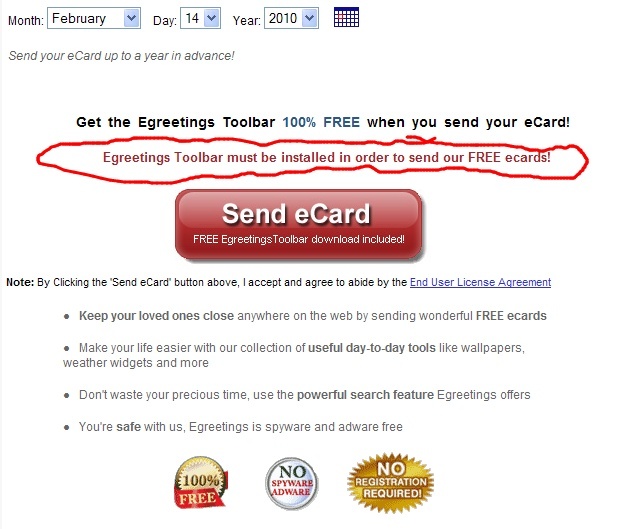 And I am insulted that Egreetings requires their toolbar to use their service. Oh, sure, they claim it's "spyware free" and so forth. But by it's nature (being required to use their service), they become spyware by default. Plus, they crow about it being free. Yes, because of the advertising. Egreetings is insulting our intelligence. "Why do you hate toolbars so much, Cowboy Bob?" Several reasons, Skippy, if you didn't catch on the first time. First, they clutter up your system and slow it down. Second, they are often spyware and malware. (Take a look at this monstrosity from My Web Search.) I've been consulted to help people remove some of these things and been surprised that they've been click happy, installing a stack of browser toolbars. Some were friendly, like Yahoo or Google's toolbars that go away when you ask them to. Others were vicious, and I had to ask Hal the Hacker to drop the assignment that I had given him so he could help me help someone else. If it's that bad for me, it'll be that bad for you, capice? Trust me on this: Browser toolbars are clutter at best. You don't need them. Addendum: Someone landed on this article because they searched for "why does egreetings toolbar still show up in my browser". Although I cannot help with that directly (have not had the experience), a stubborn bit of software can usually be made to be a good spirit and go into the light with the help of Revo Uninstaller. Use with care! If you get in a hurry, you can create problems for yourself. Follow the directions carefully and you should be fine.